Remember the ZMR? It was Hero’s attempt to ride the Karizma wave into the rapidly changing premium motorcycle segment in India. Sadly, it didn’t go to plan. Mostly because it came at a time when the market had started to boom and a whole bunch of new players were entering. So, next to the Pulsar 200s and the various RTRs, the ZMR lost its way. But now, Hero has gotten its house in order. And the result is this nice little motorcycle called the Xtreme 200R. What is it? Don’t let the name fool you, because all the 200R has in common with the previous Xtreme is the name. Underneath is the first motorcycle that Hero has fully developed in-house. That means everything from the frame to the engine is stamped ‘Hero’. And talking about them, the 200R uses a new diamond type frame that uses the engine as a stressed member. At either end of this frame is suspension from Endurance. The front is a 37mm fork and the rear is a preload adjustable monoshock. These meet the tarmac via tasty new alloy wheels with 17-inch MRF Nylogrip Zapper FYM tyres wrapped around them. And then there’s the engine. Loosely based on the Achiever’s 150cc unit, the new motor has been developed specifically for use in the 200R. It remains an air-cooled motor but makes 18.2bhp and 17.1Nm from its 199.6cc. The engine is mated to a five-speed gearbox and remains carbureted. Other new features include a redesigned, err, design with some very catchy graphics, new semi-digital instrumentation and single-channel ABS. The design itself, as mentioned before, is loosely based on the Xtreme. The front end does look like the older motorcycle, but the tank gets new, larger shrouds on it that adds some aggression to the design. There is not split seat, but the single unit does have a bump around the middle that you can brace yourself against when tucked in. The rear too is fully redesigned and now looks like a much larger motorcycle. And did we mention, the graphics look quite funky and nice? There are a whole bunch of colours on offer, but the blue with black and grey with orange look the best, according to us. Overall, the 200R is a very handsome looking motorcycle. 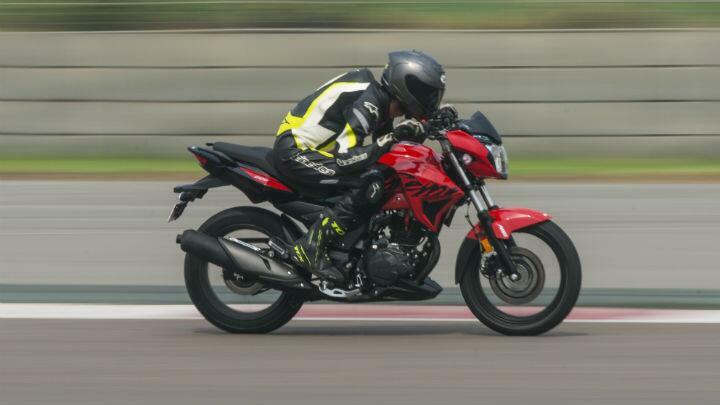 We managed to ride the 200R at the short loop at the BIC. This meant we had everything except the first four corners and the main straight to play with. Initial concerns were that the 200R would be way out of its depth in this setting. This quickly proved to be far from the truth. The Xtreme surprises with how good it is on the track. The engine delivered generous amounts of torque in the low- and mid-ranges of the rev range. It isn’t a built for hi-rev performance and considering how this motorcycle will see use mainly in urban situations, the power delivery felt spot on. The shifts are slick and smooth – not once did it mishift. The surprise though was the chassis. It had zero flex in it and the suspension was more than capable to take on the BIC’s parabola at 100kph. Turn in was quick enough without being excessively urgent. It felt quite neutral right through. What was truly impressive was how hard the bike could be pushed without ever feeling like it was on edge. Generous lean angles with the feeler bolts grinding away was not a problem at all. Even mid-corner corrections did not faze it one bit. The suspension has been tuned more for street use and, hence, focused more towards ride quality than dynamic ability. That said, it felt balanced enough to allow fair amounts of sporty riding. Final verdict about the suspension and rideability will have to wait till we get our hands on a test bike in Mumbai, but we can say that it seems promising. Overall, the Xtreme 200R feels like a nice, well-rounded package. It has enough grunt from the engine to allow for some pretty fast commuting. It has the right balance of ride quality and dynamics too. In short, it handles well, has a reasonably punchy motor and can hold its own against the competition. It is also ergonomically well balanced. The pegs are rearset enough to be sporty and the pegs to ‘bars to seat equation is comfortable yet sporty. It is a very mature motorcycle in that it does everything well without making you work hard to get it. For example, the RTR likes to be ridden hard and asks you for the same every single time you ride it. The Xtreme 200R though is a very obedient companion. It will let you putter along all well-behaved and will also let you be a hooligan when you want to. It all depends on you. At the time of going to press, the price hadn’t been announced, but we expect it to be around the Rs 90,000 mark. This puts it in the ballpark of all its competition. And for a well-balanced motorcycle that can do it all, we’d call this a win. Verdict: A well-rounded package that should work well both as a stress-free companion and a sporty ride to work.